When it comes to all the things we know we need to buy, Amazon is king. It’s where almost 75 percent of the country goes to order things like toilet paper, diapers, books, cleaning supplies, sunscreen, and toothpaste. But for all its endless pages of products, Amazon has never really been a place to browse. Over the years, it’s debuted furniture, fashion, and even handcrafts, but its user experience is still messy and cluttered, and it’s hardly a place to skim for inspiration. Amazon Scout browsing through furniture. 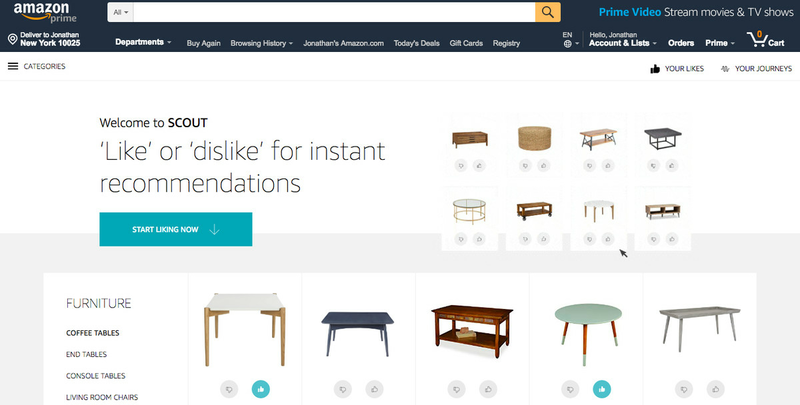 The Amazon Scout site, which was first noticed by CNBC, gives customers recommendations via a product photo and thumbs-up and thumbs-down widgets. Users are then served additional merchandise based on what Amazon believes from their likes and dislikes is the desired style. Amazon’s latest tool is clearly an attempt to compete with other sites people visit for style inspiration, like Instagram and Pinterest. Amazon has cornered the market for need-based shopping, and now it wants to be the place you go for discovery as well. Currently, the category options for Amazon Scout are furniture, home decor, lighting, kitchen and dining, patio, bedding, and women’s shoes, although the site says handbags, women’s fashion, and kids’ toys are coming soon. So how does the site actually work? In women’s shoes, for example, you can browse through the mules category, where you’re fed options like block-heel open-toe shoes, Crocs, and open-back loafers. If you click “like” on the open-back loafers, the other styles disappear and you’re fed similar options, including plenty of knockoff Gucci slides. Amazon Scout browsing for mules. In the bedding section, an initial duvet search page will give you options in color, patterns, and graphics. By disliking the colorful and graphic options and liking the white bedding, Amazon picks up that you prefer white bedding and feeds you options in several price points. I gave the rug section a swing: I was served plain, geometric, and colorful patterns. I liked the colorful options, and the geometric ones disappeared. As I continued liking and disliking, more boho, woven options appeared until Amazon eventually served me the very rug I bought for my living room a few years ago. Creepy! The fact that Amazon was able to serve me my own rug speaks to the company’s sheer weight. Amazon Scout seems to act like every other interactive algorithm that offers up options to consumers, except that it comes with Amazon’s endless database of products, and so it’s probably the only one that can actually succeed at showing you items until you land on something you like. For an algorithm-based shopping experience, Amazon Scout seems like an excellent bet for a site that’s already banking on sales without a comprehensive visual factor. According to eMarketer, Amazon has 49 percent of the total American e-commerce market. This year, it’s expected to make $258.22 billion in US retail sales. But while Amazon is the online shopping kingpin, it has competitors when it comes to discovery. Instagram is the fiercest, both as a shopping destination for its 1 billion active users and for its far more sophisticated use as a visual browsing tool. You can scroll for hours, adding clothing, furniture, and various doodads to your mental shopping cart. And Instagram has been flexing its shopping muscles: As of this week, users can now purchase directly from links placed in Instagram Stories as well as from the Explore tab. Amazon Prime might have surpassed 100 million subscribers this year, but Instagram’s database of engaged users is far deeper. In a survey Facebook released in March, the company revealed that there are more than 300 million Instagram users who are active daily, and 90 million already tap on shoppable posts. Instagram is even reportedly working on a standalone shopping app of its own. Instagram might not offer free two-day shipping, but the app’s visual layout provides a much more compelling shopping experience than Amazon. In many ways, Amazon doesn’t have an interactive user base that a competitor like Instagram does. It doesn’t have Instagram’s fashion cachet, or an influencer network that helps keep shoppers browsing — and spending — on the app. But what it does have are around 562 million products, all of which already come with images. Categorizing, labeling, and organizing all of these products into a comprehensive, visual, and easily shoppable tool is a gargantuan task, and something that competitors like eBay has been struggling with for years now. And synthesizing shopping preferences with an algorithm simplifies personal taste at best, and certainly isn’t always successful. Then again, if there’s any company that can do it — and make us believe we wanted it in the first place — it’s Amazon.